We never think much about the impressions we leave on people; in particular the strangers we encounter on a daily basis. The few minutes spent offering someone comforting words just might save their life. Sometimes, just your appearance, or the sound of your voice, or a tattoo you have, could leave someone reminiscent of a time, place or loved one.These are just some of the impressions that Juliette Laredo leaves as she goes about a more than ordinary day of July 12th. Sarah Dayan's debut novel explores the range of impressions she leaves on people- friends, co-workers, strangers, etc.- on that faithful day in New York.Already I was intrigued to read this book after learning that the protagonist is Hapa (an individual of part Asian descent). It's rare to come across books these days that showcase people of color- in particular people of mixed race heritage. I am happy that Dayan made the decision to create an already beautiful character with such a background, for it's stories like that, that need to be showcased more often; and Dayan did that to justice towards the end of one of the chapters of the book.What I loved about the book in its overall capacity is Dayan's vivid descriptions of New York. I'm from the West Coast and have never stepped foot into New York in my life. It was amazing to read descriptions of shops lined together up a street, subway rides, commuters going about their day, and a readable glimpse at the cupcake culture there.What was most intriguing above everything else of course was encountering the individuals who were graced with Juliette's presence that day. As readers, we got to learn their stories- some of them were more heavy thematically than others. When their chapters ended, they always tended to leave you wanting to know more about them. Dayan's exposure to the culture of New York was even more authentically crafted out by having the characters trace from all walks of life and statuses as well; from a single Puerto Rican mother, to an Italian cafe owner; from a Julliard dropout office worker, to Juliette's West Coast-bred, supportive boyfriend. It just goes to show that no matter where they came from, they're all connected by the fact that 1. they live in this prominent city in the US and 2. they all have a memory of Juliette encased in their minds, to some capacity.With this being a first book- and a self-published one as well- of course it was also a little rough around the edges. I encountered a number of grammar errors that appeared throughout the book that I guess weren't caught in time. There were also a couple of chapters that could have been a little stronger. But overall though, these were minor flaws. The book kept me engaged in the content provided otherwise.I definitely would recommend this book for anyone who's up for a good read about the connection amongst all humans. Dayan was wise in setting such a story in a place as collective as New York. You never know who you're connected to, or who you're going to run into. I look forward to reading more from this new author in the future to come. “More invisible than a spider’s thread, a single silky strand of commonality strung them together in a way that could easily be defined, and yet as easily went unnoticed.” On any given day, how many people (strangers, acquaintances, friends, loved-ones) do you encounter – ten, twenty, fifty or more? And from these encounters, how many lives do you knowingly or unknowingly leave a lasting impression on – an impression that may incite vivid memories, a new idea, introspection, bitterness, forgiveness, regret, heartache, jealousy, the courage to change….. “I don’t even know how many women I spoke to while I was a counselor, and for the most part, I will never know if I truly helped them. . . . For all I know, I could have been making the biggest difference in their lives, or maybe I meant nothing to them.”Sarah Dayan’s debut novel takes readers on a one-day enlightenment journey behind the veil of the unknown, where a simple cup of coffee or a word in passing or the sparkle of diamonds or a melodic voice influences the destiny of Juliette Laredo and the lives of those she encounters - and who also weave the story, thread by thread, through logistically relevant vignettes. Creatively bold and intrinsically unique, “Greater Than the Still” is a beautiful thought-provoking story; a story so profoundly engaging and fresh it begs to be savored. Dayan is gifted with the ability to write stunning prose with a commanding sparseness. She conveys volumes, capturing the breadth and depth of atmosphere and emotions within a mere sentence or two, which many seasoned authors take pages to convey. “She was a kaleidoscope, and the more he looked at her, the more he understood the swirls of her beauty.”In addition to sparse yet lavish prose, Dayan’s complementary use of symbolism, motifs, and soliloquy is not only savvy, it adds literary depth not always present in debut novels. However, I must note there were numerous typos and formatting quirks throughout the text. Whoever edited this otherwise exceptionally written novel, need not edit any more books. Then again, I received this novel as an ARC from the author, in which it could very well be an early unedited copy for story review only. All things considered, I thoroughly enjoyed “Greater Than the Still” and think it has great potential to become a top seller. And I look forward to reading future Sarah Dayan novels. 4 1/2 – creatively bold and engaging stars. Juliette Laredo is conflicted. On the brink of deciding to return to a career as a mental health counselor or follow her passion as a pastry chef, Juliette’s worries surface when she is faced with a choice - duty or passion. Moving through the story is more than a dozen New Yorkers whose lives are touched by Juliette, even briefly. This is an interesting book, one which draws you from chapter to chapter. While Juliette seems to have "finished" her story, I felt I was left dangling at the end. Throughout the story, July 12th is mentioned, but not in any way tied to the ending. But each chapter has interesting characters and circumstances. Sarah Dayan - Sarah Dayan is a self published author with a focus on literary fiction. She was born and raised in Brooklyn, New York, where from an early age, found herself writing stories about the people and places in her diverse hometown. Sarah is an extensive traveler, having been to dozens of cities across the country and over 25 countries around the world.​Sarah has blended her passions for writing and traveling at Toonari Post as a travel journalist. Various press trips have brought her to places such as Hawaii, New Orleans, Gettysburg, Baltimore, and Philadelphia. Aside from traveling the country, Sarah has also covered events and restaurant openings in her hometown of New York City. 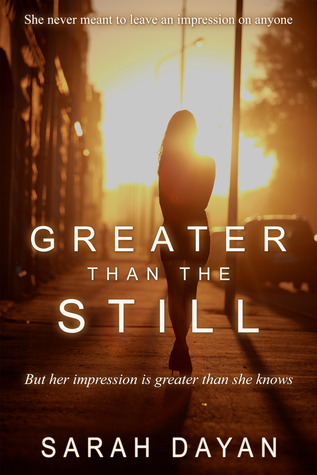 ​Greater Than the Still is Sarah's debut novel, inspired by the interconnections of people in New York City. A collection of short stories, with one overlapping story stretching the course of the novel, Greater Than the Still meshes the unique voices of people throughout the course of one day on the streets of New York. Aside from traveling the world and writing about it, Sarah enjoys playing the piano and guitar, photography, and giving in to her natural sweet tooth.